In times of trouble, one might think companies would be quick to squeeze the personal corporate jet perk for CEOs from their budgets. But many are holding on tight. Correction: The fourth paragraph has been updated with additional information about GE's earnings and forecast. NEW YORK (TheStreet) -- When it comes to executive perks, personal use of corporate aircraft is one of the most visible and lavish. And it ain't cheap. General Electric (GE - Get Report) CEO Jeff Immelt racked up a $395,237 bill for personal use of the corporate jet in 2014, and other company executives added on an additional $262,666 for their own trips, according to recent proxy filings. Boeing (BA - Get Report) shelled out $396,585 for its CEO James McNerney to use its jet for personal travel last year, and Charter (CHTR - Get Report) paid $302,272 for its CEO Thomas Rutledge to do the same. 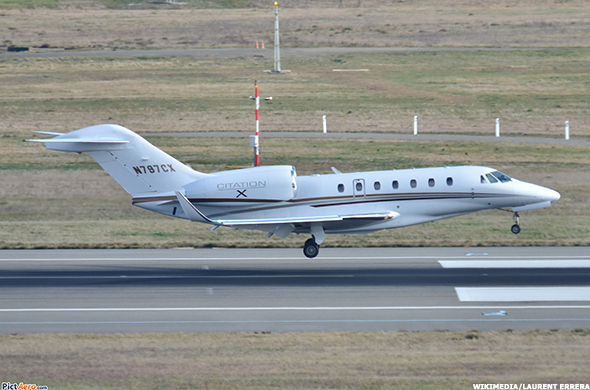 A Raytheon Hawker 800XP, the same model as one owned by Charter. Of course, these staggering numbers are just a drop in the bucket, accounting for no more than 2% of the total compensation any of these executives received in 2014. The companies they work for have multi-billion-dollar coffers as well, meaning air travel barely makes a dent. And there are justifications for the practice -- security and the valuable time of CEOs. But both General Electric and Boeing had a mediocre 2014. Despite growing industrial earnings-per-share 10%, GE shares declined 9%, and in September, Barclays analyst Scott Davis called for the company to break up. In December, GE forecast that in 2015 its earnings from power and water, aviation, and other industrial units would rise 10% but that its oil and gas business would show lower revenues, citing the "sluggish" oil and gas sector. Boeing fell 5% in 2014 and received its first underperform rating since 2009. Both companies slashed their workforces as well. GE cut 330 jobs at the start of 2015, and Boeing made plans to terminate 2,000 jobs in September and announced another 500 layoffs in December. It's a bitter pill for fired employees when they see their former boss spending their salary on vacations for their families. In the wake of the 2008 financial crisis, one would think more companies would be squeezing personal use of the corporate jet perk from their budgets. (The opposite is happening.) It's one thing to use the corporate jet for business purposes -- even the stingiest shareholder could countenance that -- but quite another to let the family take the Gulfstream to Monaco. Some companies, including Citibank (C - Get Report) , Goldman Sachs (GS - Get Report) and Wells Fargo (WFC - Get Report), have limited this kind of use. But other public corporations -- and the executives that lead them -- are holding on tight to the privilege. According to research from benefits consulting firm Arthur J. Gallagher & Co., the personal use of the corporate aircraft continues to be the most popular perk among executives. Of the top 200 companies in the U.S., 57% offer the benefit, the median value of which is $100,900. In 2007, 67% of companies offered it for a median of $122,000. Equilar reports similar figures current among Fortune 100 CEOs, 68% of which are eligible to receive a perk related to personal use of a corporate aircraft. It found a median value of $98,257 and mean of $141,187. "That doesn't mean your CEO of a hundred-million-dollar company is getting $100,000 in aircraft usage," said Aaron Boyd, director of governance research at executive compensation consulting firm Equilar. "In fact, they're much more likely not to receive anything." 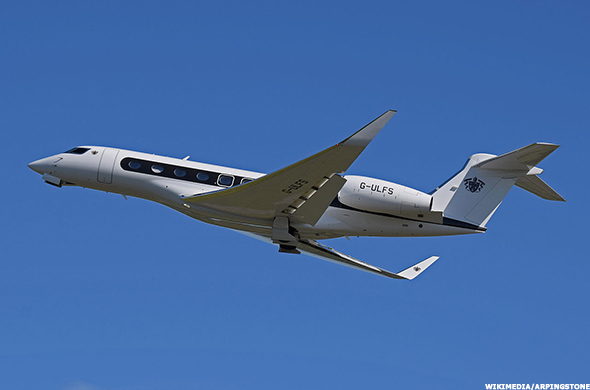 The Gulfstream G550 is one of the more chic models. Target owns one. As to why personal use of corporate aircraft use remains so prominent, there is no one good answer. "It's a matter of status. It's a matter of convenience. It's a matter of safety," said David Schmidt, a senior consultant covering executive compensation at Arthur J. Gallagher & Co.
Alan Johnson of compensation consulting firm Johnson Associates emphasized that the practice is largely a way to avoid the hassle of commercial flights, pointing out that CEOs work on tight schedules and often need to fly destinations in more remote areas on the map. "From a personal standpoint, it's just convenience," he said. And while some firms simply prefer for their executives to use company aircrafts (for convenience, availability, etc. ), others flat out require it. The CEO of Cigna (CI - Get Report) , David Cordani, is "encouraged" to use the corporate aircraft for both personal and business matters, which according to its proxy statement "serves to increase his time available for business purposes and as a means to better ensure his safety and security." In 2014, his bill was $147,810. IBM (IBM - Get Report) requires that all of Ginni Rommety's air travel be on one of its planes. Last year, her personal trips cost $164,060. Cigna had a strong 2014. IBM not so much -- its share price dropped 12%, and the size of its workforce declined for a second consecutive year. Security: A Real Concern, or a Convenient Excuse? Security is the explanation most commonly listed in proxy statements for corporate aircraft use by company CEOs. Per Equilar's research, 39% of Fortune 100 corporations use it as their main defense. PepsiCO (PEP - Get Report) highlights security as its principal rationale for requiring CEO Indra Nooyi to utilize company air and ground transportation. It has gone as far as to commission an independent study to prove its case, which its proxy statement says identified "real and present risks for Ms. Nooyi due to her considerable visibility in multimedia venues as the leader and identifiable face of PepsiCo, one of the largest and most recognized U.S. corporations." In 2013 (the 2014 proxy filing isn't out yet), Nooyi's personal aircraft use costs reached $102,772. Competitor Coca-Cola (CO - Get Report) provides a similar package to its CEO, Muhtar Kent, and emphasizes security purposes due to the "high profile and global nature" of the business. Coca-Cola's proxy statement also clarifies that Kent and his immediate family may use its aircraft for a "reasonable number" of personal trips. Personal aircraft use for Kent amounted to $178,493 in 2014, down from $239,924 in 2013 and $292,676 in 2012. Coca-Cola calculates costs per hour, but the going rate isn't something it reveals (because they're not required to, most companies don't). To put it in perspective, even that lowest figure could be used to fly round-trip, first-class on a commercial airline from New York to London more than 20 times. The Gulfstream G650 in flight. 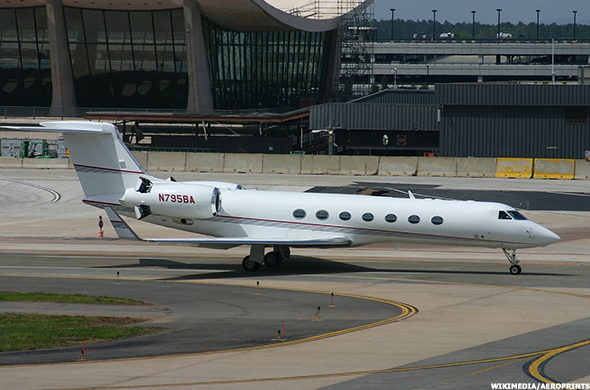 Nike (NKE - Get Report) owns one of these highly coveted jets. Compensation criticism and performance aside, for companies the size of Pepsi and Coca-Cola, the argument can be made that security concerns make sense. But for smaller firms, the safety explanation feels like a bit of a stretch. "Hundreds of companies use that as an excuse, but there are probably 50-to-100 companies where it's the real deal," Johnson said. "Security is the real deal for some global, well-known American brands, but there are many companies, of course, where no one has ever heard of the company, let alone the CEO." To be sure, some insist that even for the highest-profile CEOs, the security defense doesn't add up. "Airports are about as safe as you're going to get. I find the whole argument rather specious," said Charles Elson, Jr. Chair in Corporate Finance and Professor of Finance at the University of Delaware. Beyond budgeting, the personal use of a corporate aircraft comes down to what it symbolizes and the message it sends, especially when things aren't going well. "When you're asking your employees to keep costs down to create shareholder value and you are using corporate funds to finance a lifestyle that is way beyond the reach of anyone who works for you, that is a real bad signal," Elson remarked. Johnson echoed his warning: "The audience is not only outside shareholders, it is also your own employees." And in some cases, companies use corporate aircraft use to send a message that is, frankly, quite contrived. Doug Peterson, the CEO of embattled McGraw Hill Financial (MHFI , has pledged to fly commercial, setting a more austere tone for his workers and giving a budget-conscious appearance to his leadership style. In terms of CEO travel budgets, it won't make much of an impact. While the firm's previous chief executive used the company aircraft extensively, he always reimbursed it for all of his airtime. Peterson's move is more symbolic than it is wallet-friendly. Target (TGT - Get Report) has had a tough go recently, coming under fire over wages and data breaches. It recently gave in on the employee pay front, but before that, it made adjustments to its CEO's personal flight package. In a move that seems largely PR-driven, Target capped personal company jet use for its new CEO, Brian Cornell, at $175,000. 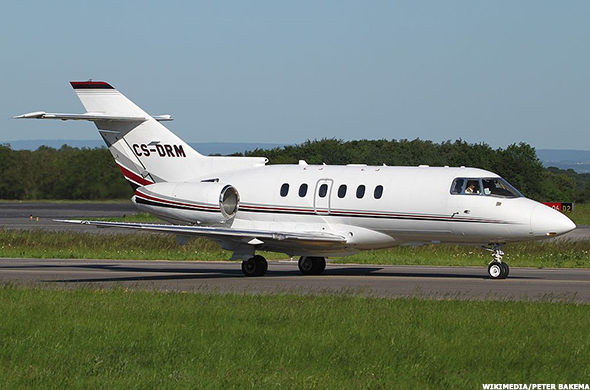 The retailer's previous CEO enjoyed unlimited personal use of the company's planes, but he never exceeded -- or really came close to -- that amount, meaning that use of the company's three Cessna Citation X business jets and its one Gulfstream G550 won't really be limited at all. A Cessna Citation X business jet, the same model owned by Target. United Technologies Corporation (UTX - Get Report) has put a 50-hour cap on the personal use of its aircraft for new CEO, Gregory Hayes. His predecessor, Louis Chênevert, racked up $115,000 in costs last year before making an abrupt exit in November amid concerns over his level of engagement in company matters -- or, rather, lack thereof. These types of maneuvers are ways to send a message to shareholders and employees as well as to keep critics at bay. "Anything not consistent with performance is a lightning rod for criticism on the part of activists and shareholders," Schmidt said. But to some, executives using company jets for personal purposes just never looks good. "Corporate aircrafts are supposed to be used for corporate purposes," said Elson. "It's like taking the company car to Disneyland. That's not what you have the company car for."